Strombo has dropped a clue as to the future of his radio show now that he's parting ways with Corus. He just posted a teaser on his blog. George Stroumboulopoulos is talking about "a new, independent FM". That's the change coming this fall, referenced in his Facebook message on The Strombo Show page. Does anyone have a guess as to what this new, independent FM will be? Is it web streaming? A new satellite radio show? A CBC radio show? A podcast? I hope it's a podcast. I'd love to get Strombo uncut and unedited saying what he wants to say. I had a chat with him once after a taping of The Hour and I told him how much I loved the show he did on the FAN back in the day called Game. He got a kick out of that and said he'd love to do something like that again and I suggested he could do it as a podcast. So if it happens, you can thank me. Toronto really needs a new radio station. Toronto really does need an independent FM, but truth is there's not really an available frequency. Moreover, I'm sure George does well, but he doesn't have the millions it would take to apply for an FM license either. I'm betting a podcast or possibly something in conjunction with CBC Radio. I ran into George once and talked to him about Game as well! That was a great show. if it was going to be a podcast or on satellite why would they call it FM? 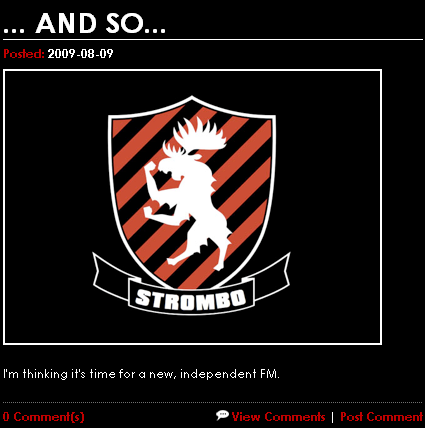 Not sure, but there is a precedence for the "FM" moniker used for internet sites, such as LastFM.